This blog is an opportunity to share my creative life with you, whether you’ve seen my illustrations in children’s books, have made projects from my how-to book, Felt Wee Folk, or are a lover of embroidery and textile art. I will share pictures of my studio and work in progress, along with images and artists that I find inspirational. After years of quietly working in my own private space, I feel compelled to communicate with like-minded people, who have a passion for stitching. I plan to present current, new work as well as dip into the past, showing early works made during my 30 year career. It may take a while for me to become comfortable sharing my ideas and reflections in writing, as I am more content to make and show than explain in words. So, rest assured that I will be posting lots of images! I made this piece for a self-portrait invitational show in 2007. 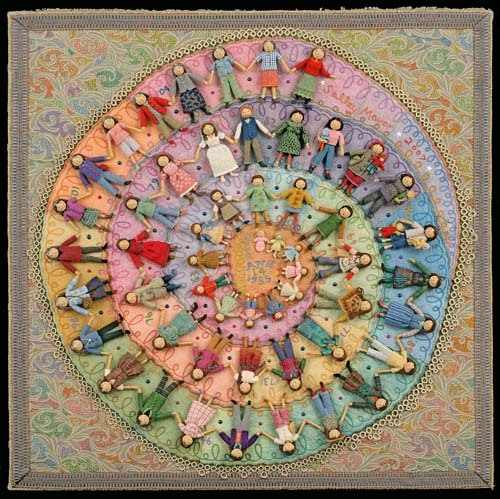 It shows a spiral of dolls, one for each year, starting with my birth date in the center. Each figure is dressed in an outfit I would have worn that year, taken from memories, family photos or imagination. The dolls are a variation of the wee folk and fairies in my how-to book, Felt Wee Folk. I made many of my original dresses and recreated them here with smaller scale fabric and embroidered wool felt. My husband, Rob, appears the year we were married and my sons, Peter and Ian, are included through the years when they were little and physically connected to me. The tatting around the outside of the circle was made by my late grandmother, Louise Salley Hartwell. The wool felt spiral is mounted on upholstery fabric, which I embellished with multicolored french knots. My husband Rob and I made the following film set to music I remember hearing through the years. This entry was posted in Dolls, Fabric Relief, Family, Self Portrait, Woods Hole by Salley Mavor. Bookmark the permalink. Hello Salley, What an amazing piece…absolutely breathtaking!! I look forward to your new work and blog. Sally, thank you for coming out of your cocoon and sharing your incredibly exquisite work! I can’t hardly wait for you new book to come out. I told the handwork teacher at our school that your books are a “must have” for the students. I hope some magic will happen and I can have a chance to see your work close up. Wow, Salley! Thanks so much for letting me know about your blog. I am SO impressed with your “self-portrait” project. What a truly wonderful and irreplaceable keepsake! I am incredibly happy to see that you are making your fairie dolls again. My aim is to collect as many as possible. Thank you, thank you! This is a wonderful way for me to see you when I’m away, and to see your extraordinary work keep expanding. Thanks! – for delighting us and for being such an inspiring example. Hello, Salley! This is just terrific to have your blog. Another dimension, another delight. It will be lovely to follow and I’m eager for the next. Meanwhile I smiling over your wardrobe evolution. What a concept and a joy for the rest of us. Yours is one of the blogs I’ll actually take time for! And I’m happy to know we can direct the continuing fairy requests to you. Unbelievable, inspirational, amazing, beautiful, heartfelt, wow! You are so amazingly talented. I love all the attention to detail. I very much look forward to following your blog! Fantastic! Just a quick note to Thank you for entering the blog world. I am a big fan of your work. Wonderful! Hand crafted art meets hi tech! Congratulations! Thank you to all who have visited my new blog. I can hardly sleep, thinking of new posts to make. Please keep visiting! Wonderful blog, Salley –I particularly love the autobiographical spiral piece. Nice to be able to see your art whenever I like. Keep it coming! This is probably the most beautiful, wonderful piece I’ve ever seen. Amazing! I stumbled on your “Felt Wee Folk” book at the Michael’s store, and made my first doll with my daughter tonight. I went searching for more pictures and information and found your blog. What an absolutely beautiful piece this self-portrait is. ‘Blog’ as a word does not capture the visual richness and thoughtful text! We need a new word! Simply incredible. What a LOT of work this must have been. It is beautiful! This piece is incredible! I love the way you included your children! Truely lovely! Hi Salley, we must be of the same “vintage”. I recognize those 70s clothes! Wow! I’m so glad to see you’re blogging. Your work is charming and lovely and inspired. I’ve looked to see if you had a blog before, and will be excited to see what you’re up to next. Many thanks! I found you via Pintangle, and I am overwhelmed with admiration for your gorgeous work, especially the self portrait, wonderful! Your Sef-portrait is an amazing masterpiece! I am absolutely astounded, wow! I have recently made a couple of “Blossom Fairies” from your “Felt Wee Folk” book. It is so much fun! I need to ask you a couple of questions regarding the Wee Folk. I don’t know if it is possible to get an email address from you or not. Once again, what amazing work! Tanya, thanks for your nice comments. You can contact via the e-mail address that is on my website. Hi Salley! Your self portrait piece is absolutely amazing, inspiring and breathtaking! What a treat to be able to follow your blog. Wishing you all the best!! Hi Shari, thanks so much for visiting my blog. It’s been too long-I hope we get to see each other in the next decade! it has been a very humbling experience to review your body of work..
i wish i could see more.when it comes to your work i am in awe. Such a wonderful piece, all your work is special but this one takes the cake! Thanks for blogging, this is going to be a real treat for us, your fans! I loved viewing this piece when it was on display at the Falmouth Art Center. There sure was a lot of buzz around it! Great blog, Salley. I look forward to enjoying more of your posts. Thanks so much for letting me know about your blog–and welcome to the friendly world of blogging in cyberspace! What a treat for us all, your work is so beautiful and this piece here is AMAZING! I’ve been doing this blogging thing for five years now–nice to see you know Mimi. The world is a lot smaller in here. Funny, going through your posts just now, it occurred to me I’m making little dolls too, but with pipe cleaners and glue and spun cotton heads. Just sold a new book manuscript too; so life is good and very busy at the moment!!!! This has to be one of the most amazing self portraits I’ve ever seen…I am SO very delighted that you posted and shared it with me. It is beyond LOVELY! I can only repeat the others, this is an amazing work. I haven’t ever seen such an interesting piece as this! I can’t even begin to describe how awesome this is! I wish I could see it in person! I must try and get me one of your books! What a beautiful piece!!!! Absolutely love it. How did you come by such a creative idea?? I’m so glad that you’ve seen and enjoyed my self portrait. Like most ideas, there’s no simple source, but a mysterious set of influences and connections. As an artist, it’s my job to come up with ideas, so my mind is always imagining subjects and materials. It’s a fun place to be! Thanks for visiting. Salley, what a JOY it was to see your life in dolls! Such lovely work and such a wonderful way to display it. This was a real treat!! I’ve spent the past two evenings eating up your blog. You are a truly gifted artist and a wonderful family historian. I purchased Pocketful of Posies and am waiting for Wee Folk so I can begin to make my own projects. Thank you so much for allowing all of us to peek into your projects and life. But what makes the Warli illustration different is that apart from the circular arrangement, the entire Warli world, including myth/ imagery/ seasons/ life changes is illustrated around the circle, whereas your circle is rich in itself, and all the life details are in the figures of the circle itself. Thank you for the pleasure you brought to me in seeing this absolutely rich piece of work. I saw this piece at the Brattleboro Art Museum and spent a very long time looking at all your costumes through the years. What beautiful details, what a wonderful show! I was delighted to discover your artwork. I decided Pocketful of Posies was the perfect Christmas gift for my little 7-month-old nephew. I purchased your book, “Wee Folk” when my daughter was 15 (she is now 20 and a new mother). She had a close friend spend the night once that year and I brought my new book, along with lots of felt, threads, combed wool (I spin) and all manner of goodies, into the kitchen with the two girls and announced we were going to make tiny dolls. You should have seen their teenage faces! At first hesitant and then fascinated and completely absorbed, those two girls insisted on staying up till 2:30 in the morning so their little people could be finished! We talked about everything and laughed and laughed and when we were done, we sat and looked at our little people with the greatest satisfaction and joy. Just recently, my daughter’s same good friend came to our house to visit and told me that night spent here was the most fun she has ever had and that she felt so much love in our home. She has her little Wee Folk doll still and wants to make more with her children when she has them. I just thought you might like to hear that your art has the most profound effect on others in such a positive and loving way. Thank you for your years of sharing. Thank you for leaving your examples of doll art on your website as inspiration for those of us who cannot get enough of them. I am sure you will be blessed in all your new endeavors. And finally thank you for being true to yourself, for in doing that, what you have created is truly magical. Another amazing piece! I love all the different outfits. You amaze me! Love when I get an email from your blog, showing all your new work! I just discovered you and your fantastic work yesterday. Now I’m waiting for a copy of you book to pop through my letterbox. I suffered a ruptured brain aneurism and I’m trying to get back into sewing and crafting, but big projects are so frightening to me. So I’m failing before I begin. Then I saw your wee folk!! And I’m inspired. The whole concept is new to me, I’ve not created anything so small before, and I’m raring to go. Thank you for sharing your wonderful talent. Welcome to the wee world, Olive. It sounds like making these little dolls might be the perfect way for you to regain your abilities and confidence. And it’s fun!